We are still here, still working hard on the game, sorry that the blog gets neglected a bit. 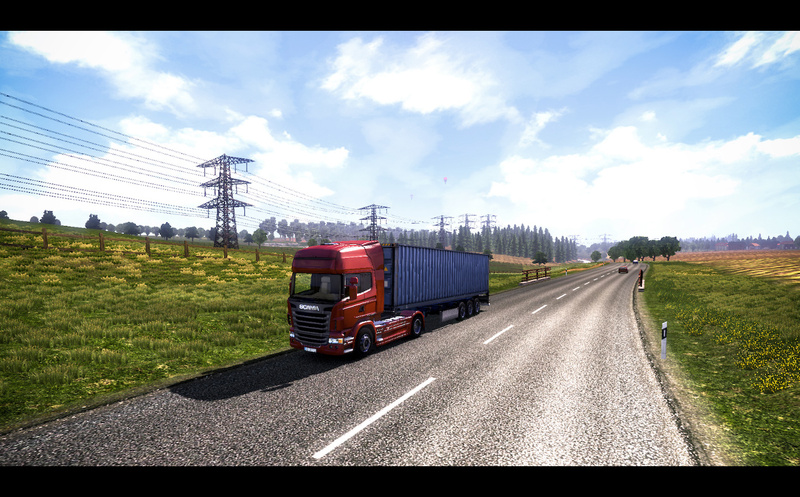 We plan to have some unveils of cool ETS2 facts and features in the coming weeks, but for now, to satisfy your never ceasing appetite for more news, let us just post a few nice screens which we took this week on request from one of our distribution partners. On first screen this hill with flat textures of trees are very ugly. Can you correct that? And headlamps should shining stronger. Excellent pictures, I can't wait to see what you will be unveiling. And if it shortens the release date of the game, don't post as much. Don't spend precious time you could be spending on new material on posting stuff if it takes too much work. OMG, that's awesome, can't wait to drive with the Topline on those roads :). I like the mountain roads and the little roads trough the countries ! Nice job ! Is to make the trailer more personalized, are very simple. One question SCS in the night picture will the marker lights above the window be working and the same for the rest of the trucks. I am also impressed with that 3rd picture down with the low level look and the angle to the Scania its so realistic it would be hard to tell it from the real thing. The truck SCANIA seems very real! !, and The environment it's better than ever! And the effect of rain? would like to see the rain and fog at night and day. And the traffic, there will be congestion? Roads look Really Good! Thx For news SCS, Hope that the new fact will be a good news! I love the last picture road texture. Splendid images. Keep up the outstanding work SCS Software team. perfect, very good job SCSsoft! SCS, I would like you to make windows in the vehicles openable. They could have realistic motion. That would make it even more realistic. And when it rains, make it so that the windows fog up and the player must turn on the ventilation fans. Why is the engine model number (R430 or something) gone from the Scania model? Previously it was there on the front of the truck. Very good. The game are beautiful. With highways proportional to the real, maybe big or small. I always see the moon, but never the sun. Why ? 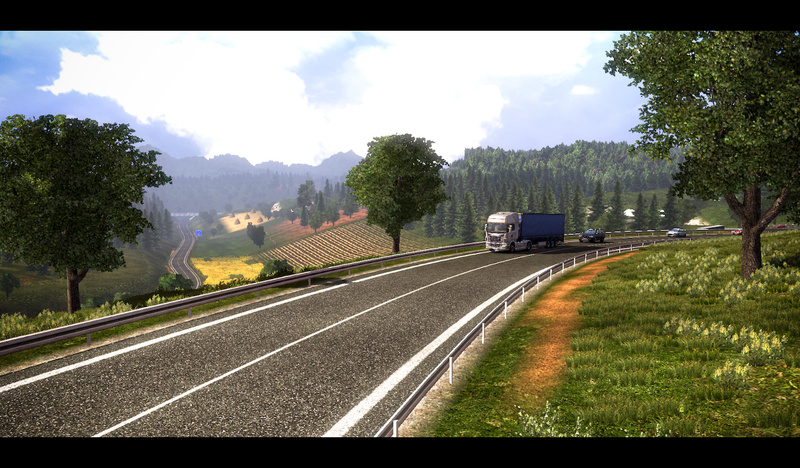 First image - very well designed vegetation and highways. Second image - This lake and this island are perfect, very amazing. Third image - I like very much this truck, this picture are amazing. But are missing the "Highline" on the cabin top. Four image - This night are very realistic, but the moon light suggests that it is in front of the mountain. 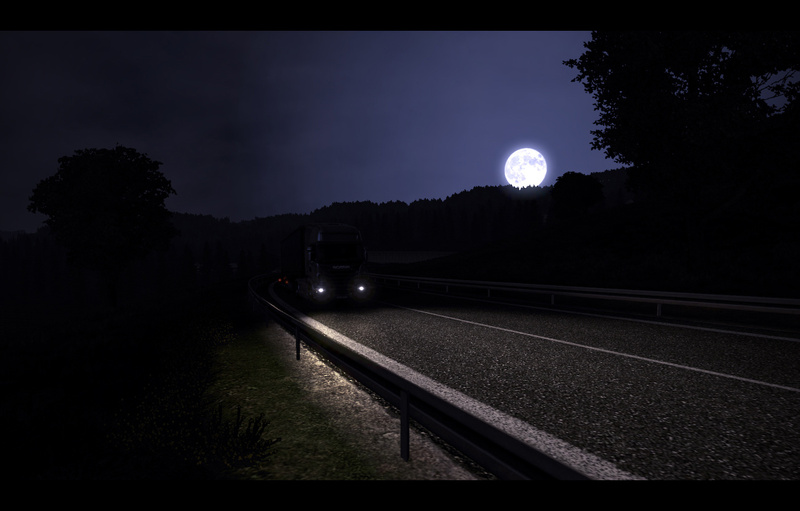 Five image - In an open highway like that the imaginary wall, of threedimensional world, will be closer or more distant compared to German Truck Simulator ? good and nice pictures, is this in Austria or Germany? Please, SCS is very important everytime rains the water should stay more longer on the road for several days this feature is not available on GTS and ETS and in every season we must change the truck tyres for summer dry tyres and for winter wet tyres and don't forget the tyre pressure on the dashboard. Thanks. Very nice screenshots am denfity buying this game. 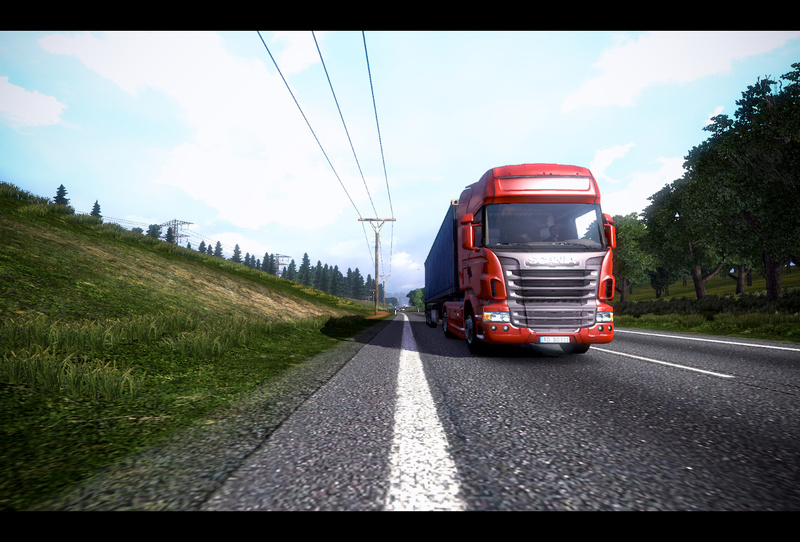 The Scania is doing it so well as a Renault! when is the debut of the game, I'm eager to play! Description We are looking forward. Paylaş Haber, every story published in the Türk Mods and Oyun Mods share sites. The Turks look forward to the game. Now listen to me, waiting for an explanation from you about the release date. scania looks very real?i dont think so! those mirrors have nothing to do with reality,shape too! Good but night is still a little bit too bright (although the night in that screenshot is a huge improvement compared to previous games and screenshots) also unrelated to these screenshots can you add more different vehicles such as coaches and change buildings the buildings shown in previous are the same as some in previous games and if people download the demo and see same buildings they might not buy the game. I noticed writing on the Renault, is there a chance we could edit and add our company name on our trucks. That would be cool. 1. gps navigation system - Done! So I want everybody to read and think to the game to complete this list for SCS! Good luck and from everybody sees, this game will be a hit baby! Never can SCS this All....The Graphicengine of ETS/GTS/ETS2 is a LAGGY ENGINE.... ETS2 is Only a New Addon without All your Features NO PEDESTRIANS...... ALL TIME TH SAME GHOSTTOWNS. ÇIKARIN LA ARTIK ŞU OYUNU ! coo does this mean we will have credible darkness/headlamps without having to faff with the settings and customise the beam patterns? Previous SCS had poor headlamps (not long enough beam pattern, not bright enough on high beam) and night that wasn't dark enough. Took a good bit of cutomising to make it look credible, in ALH and ETS. Lets hope the physics will be better to match the nicer eyecandy. My big problem with all SCS truck games is that the truck when loaded just don't handle like 44 tonnes of truck, - also, on early games especially, tyre grip was pretty unpredictable. THE NIGHT IS DARKER THEN PREVIOWS GAMES, BUT IT SHOULD BE EVEN DARKER. YOU CAN'T SEE SO MUCH DETAILS LIKE LOGO, ETC. IN NIGHT. Is the last image Sweden? It's looks like it on the road markers. Good luck and from everybody sees, this game will be a hit baby!" For All of you out there who think that the picture of nightshot is not dark enough check it out city lights, streets lights,clouds reflection, moon lights,even stars light produce shadows. Too dark in the game wont look good can not see details It look very good as it is. Please Do not ask for anything more to be done in the game. SCS people will never be able to finish that game. All i ask is that the game has got a story to it. Similar to UKTS there is a reason to the game, If this is possible maybe to be able to see the other trucks you buy or garages with your name on them (Custom Name) by image upload to the game. Being able to upload images to your trucks that you buy. 18 Wheels of steel example you can upgrade your trucks but you never ever see them. Keeping things interesting ingame keeps people playing. Get all the truck's license, please. Could you please post a picture of map that is planned to made. I'd like to see what cities and roads will be included. * Multiplayer mode, were you can play the career with your friend would be really creat! * Trucks get dirty (washing possibilities). * Driver can open the windows (cabin will go too hot or too cold). * GPS - that's done if there is also a possibility to have in on your dashboard or somewhere. It shouldn't be only a gadget. * Pederastians in the city. * Tyre punctures and cracks on windshields (possibility to replace them) and mechanical failures. Nevertheless, SCS, you're doing wonderful job! Thank you very much! It looks good, still 3 months to go! What the anonymous said above me, busses are also in the hard truck 18wos, 2 models. I also agree with the above two there who also wrote it. And beautiful pictures! 2. mud and dirty trucks -> wash them in service etc. 7. led indicators on the road by accident, speed, etc. It would be good to have radartraps and pull-overs on road,to check tachograph. And,don't forget the dashboard lighting when at night,using headlights!!! Ahem, all SCS have said it is not coming 2011. Anything else you have read or heard is speculation. Try checking the previous entries in the log. please please please come out before christmas. Don't rush the company, they have to take their time and make sure this game is their best by far that they've ever created. Yes... night looks like real night on that screenshoot :) Very nice really dark night.